Watch This! 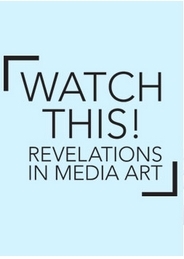 Revelations in Media Art presents pioneering and contemporary artworks that trace the evolution of a continuously emerging medium. The exhibition celebrates artists who are engaged in a creative revolution—one shaped as much by developments in science and technology as by style or medium—and explores the pervasive interdependence between technology and contemporary culture. The exhibition includes 44 objects from 1941 to 2013, which were acquired by the museum as part of its longstanding commitment to collecting and exhibiting media art. Watch This! includes major works by artists Cory Arcangel, Hans Breder, Takeshi Murata, Bruce Nauman, Raphael Montañez Ortiz, Nam June Paik, Martha Rosler, Eve Sussman, Bill Viola and others that highlight the breadth of media art, including 16 mm films, computer-driven cinema, closed-circuit installations, digital animation, video games and more.